Disability policy issues, family-based caregiving, and health services for people with disabilities. Research consists of several longitudinal studies of families with a child with disabilities. A professor emerita at Heller, Krauss is a renowned expert in intellectual disabilities, with a focus on the impact on families, social services, and public policy of having a family member with intellectual disabilities. She is a past director of the Nathan and Toby Starr Center on Intellectual and Developmental Disabilities and served as associate dean for faculty and academic programs at the Heller School. 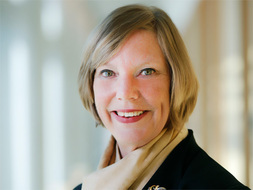 From 2003 to 2011, she was the provost and senior vice president for academic affairs for Brandeis. Marty W. Krauss was the interim dean of Brandeis' Heller School for Social Policy and Management from 2014-2017. Krauss joined the Heller faculty in 1984 and has spent her entire academic career at Brandeis. In addition to her faculty appointment, she is a member of the Heller Board of Overseers. She is the recipient of many awards and honors, including the Joseph P. Kennedy Jr. Foundation International Award for Leadership, the Christian Pueschel Memorial Research Award of the National Down Syndrome Congress and the Distinguished Research Award of the Association for Retarded Citizens of the United States, among others. She is also a fellow of the American Association on Mental Retardation. Her contributions to Heller were recently recognized when Krauss was awarded the Heller alumni service award at Heller’s 55th anniversary celebration this past September. Esbensen, A. J., Seltzer, M. M., Krauss, M. W.. "Stability and change in health, functional abilities, and behavior problems among adults with and without Down syndrome." American Journal on Mental Retardation 113. 4 (2008): 263-277. Krauss, M. W., Seltzer, M. M., Jacobson, H. T.. "Adults with autism living at home or in non-family settings: positive and negative aspects of residential status." Journal Of Intellectual Disability Research 49. (2005): 111-124. Krauss, M. W., Abbeduto, L., Seltzer, M. M., Shattuck, P., Orsmond, G., Murphy, M. M.. "Psychological well-being and coping in mothers of youths with autism, Down syndrome, or fragile X syndrome." American Journal On Mental Retardation 109. 3 (2004): 237-254. Krauss, M. W., Greenberg, J. S., Seltzer, M. M., Chou, R. J. A., Hong, J.. "The effect of quality of the relationship between mothers and adult children with schizophrenia, autism, or Down syndrome on maternal well-being: The mediating role of optimism." American Journal Of Orthopsychiatry 74. 1 (2004): 14-25. Krauss, M. W., Leiter, V., Anderson, B., Wells, N.. "The consequences of caring - Effects of mothering a child with special needs." Journal Of Family Issues 25. 3 (2004): 379-403. Krauss, M. W., Magana, S., Seltzer, M. M.. "Cultural context of caregiving: Differences in depression between Puerto Rican and non-Latina white mothers of adults with mental retardation." Mental Retardation 42. 1 (2004): 1-11. Krauss, M. W., Orsmond, G. I., Seltzer, M. M.. "Peer relationships and social and recreational activities among adolescents and adults with autism." Journal Of Autism And Developmental Disorders 34. 3 (2004): 245-256. Krauss, M. W., Seltzer, M. M., Abbeduto, L., Greenberg, J., Swe, A.. "Comparison groups in autism family research: Down syndrome, fragile X syndrome, and schizophrenia." Journal Of Autism And Developmental Disorders 34. 1 (2004): 41-48. Krauss, M. W., Gulley, S., Sciegaj, M., Wells, N.. "Access to specialty medical care for children with mental retardation, autism, and other special health care needs." Mental Retardation 41. 5 (2003): 329-339. Krauss, M. W., Kim, H. W., Greenberg, J. S., Seltzer, M. M.. "The role of coping in maintaining the psychological well-being of mothers of adults with intellectual disability and mental illness." Journal Of Intellectual Disability Research 47. (2003): 313-327. Krauss, M. W., Orsmond, G. I., Seltzer, M. M., Hong, J.. "Behavior problems in adults with mental retardation and maternal well-being: Examination of the direction of effects." American Journal On Mental Retardation 108. 4 (2003): 257-271. Krauss, M. W., Robison, D.. "Lessons from the field: Participatory action research in a family research project." Mental Retardation 41. 6 (2003): 460-464. Krauss, M. W., Seltzer, M. M., Shattuck, P. T., Orsmond, G., Swe, A., Lord, C.. "The symptoms of autism spectrum disorders in adolescence and adulthood." Journal Of Autism And Developmental Disorders 33. 6 (2003): 565-581. Krauss,Martha W with M.M. Seltzer, J. Hong, and G.I. Orsmond. "Continuity or discontinuity of family involvement with adults with mental retardation following residential transitions." Mental Retardation 39. (2001): 181-194. Krauss,Martha W, with N. Wells, S. Gulley, and B. Anderson. "Navigating systems of care: Results from a national survey of families of children with special health care needs." Children's Services: Social Policy, Research, and Practice 4. (2001): 165-187. Krauss,Martha W with M.M. Seltzer, G.I. Orsmond, and C. Vestal. "Families of adolescents and adults with autism: Uncharted territory." International Review of Research on Mental Retardation 23. (2000). M.E. Warfield, M.W. Krauss, P. Hauser-Cram, C. "Adaptation during early childhood among mothers of children with disabilities.." Journal of Developmental and Behavioral Pediatrics 20. (1999): 9-16..
M.W. Krauss with P. Hauser-Cram, M.E. Warfield, J.P Shonkoff. "Family influences on adaptive development in young children with Down syndrome." Child Development 7. (1999): 979-989..
Krauss,Martha W, M.J. Guralnick.. Two generations of family research in early intervention, in The Effectiveness of Early Intervention. Baltimore, MD: Paul Brookes, 1997. Krauss,Martha W, co-ed with M.M. Seltzer and M.P. Janicki. Life Course Perspectives on Adulthood and Old Age. Washington, D.C.: The American Association on Ment, 1994. Krauss,Martha W, co-ed. with M.P. Janicki & M.M. Seltzer. Community Residences for Persons with Developmental Disabilities: Here to Stay. Baltimore: Paul H. Brookes Co., 1988. Krauss,Martha W, with M.M. Seltzer. Aging and Mental Retardation: Extending the Continuum. Washington DC: The American Association on Mental , 1987.